As featured in previous Thinking Locally posts, the morale diaries offer a rich accounting of civilian life from 1942 through 1944, and much of what the RASRL writers reported on was what they observed and overheard as they rode the buses. Among these entries is a remarkable paper that provides a detailed analysis of the changes in bus routes and ridership and a significant change in those employed as bus drivers (UHSj-436b-I, “Effects of the War on the Bus Situation,” Student Journals Folder 14). According to this writer, in November 1941, the average number of Honolulu Rapid Transit (HRT) passengers per day was 135,484. But with the arrival of defense workers and servicemen, the rationing of gas and tires, and the decrease in delivery services offered by stores and markets . . . The annual increase of passengers as given in the “Paradise of the Pacific” July 1943 is 38 million riders in 1941 to 69 million in 1942 and to 100 million in 1943. In November 1941, HRT had 166 buses, but by November 1943, the fleet had increased to 269 with twenty-nine of these being leased from the Navy. To accommodate shifts in ridership, HRT added new routes to Naval Housing, Red Hill, and Makiki Roundtop, the first two as a result of the increase in defense workers and the third to provide service to civilians living in the Roosevelt High School area.
. . . May’s Market used to offer daily delivery service but with the gasoline ration, tire shortage, and labor shortage the services were reduced to three times a week. In such a situation some of the housewives were forced to do more shopping on their own, causing them to ride the bus oftener than usual. As with other service occupations, long-time HRT drivers were lured away by better paying defense jobs. In order to retain drivers, wages for bus drivers increased. I remember many boys were leaving their jobs because they wanted to get better paying jobs as defense workers. Why should they stick onto a job that pays $.65 when they could get a job that pays $1.65 an hour. So one by one they came in saying, “I quit, I quit!” I wanted to quit on the fifteenth, but I wanted my bonus so I stayed on my job until the sixteenth. The next day, on the seventeenth, an order came out stating that we were frozen to our jobs. There I was, stuck with my job. Any deliberate attempt to “quit” their jobs now means a court case. The sessional labor control, which is headed by J.R. Mead, takes charge of these attempts by bus drivers to “quit” their jobs. The first offense, such as staying away from work without being sick or deliberately slowing up the bus means that the bus driver will be given a word of warning, most often through a letter, by the Sessional Labor Control; at the second offense the bus driver must report to the Sessional Labor Control within 48 hours; at the third offense, the bus driver will be given a verbal warning; and at the fourth offense he will be given a PM Subpoena (P.M. – Provost Marshall). We used to have a good doctor before, but the company fired him because he was too nice to the bus drivers. Now there’s a new doctor who “plays ball” with the company. I know of a boy who asked for a release, and the company refused him until one day he finally collapsed from the strain of driving. Don’t think driving is easy. The hours are long, the passengers are not always nice, the traffic is heavy, the safety of the passengers is in the hands of the driver – all these easily break the high strung man. Yeah, they’ll kill you before they release you on ill health. Drivers who had too many accidents could be “released.” However, even when let go, the bus driver could not apply for any government job or any other job for ninety days. If he found a job during the restricted period, his employer would be fined $150 and the driver, $100. Eventually, this requirement was eased up to exempt non-government jobs. During the War, the number of drivers increased from 75 to 100 per cent of what this workforce had been prior to the War, but this still didn’t meet the demands of newly added routes nor did it ensure good service to the increased number of passengers. The shortage of labor was especially acute during the first eighteen months after the outbreak of the War. As a result the company began to ease up on the qualifications for applicants. Formerly, the physical requirements required that applicants, who were all men, be a minimum height of five feet six and one-half inches and a minimum weight of 140 pounds. Desperate for drivers, HRT now hired drivers who barely reached five feet and weighed little more than 100 pounds. In the writer’s interview with Mr. Lochbaum, superintendent of transportation, she learned that pre-war drivers were from all races. 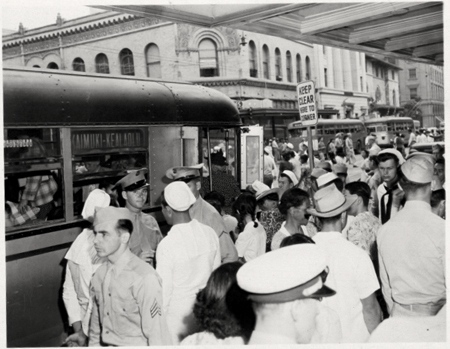 However, she noted that before the War “it seemed as though there were only Hawaiian bus drivers,” which seemed probable due to the physical requirements, and Asians were restricted to working as mechanics and repairmen. From the bus driver instructors, the writer learned that a kind of ethnic profiling had been in place: Hawaiians were best because they were calm, an important characteristic in “such a responsible position”; second best were Haole and Portuguese, as long as the former didn’t see the job as temporary and the latter could be “the center of attention.” The Japanese were third since “they feel the weight of responsibility too much and tend to be at times highly strung.” The Filipinos, the instructors added, were the worst because “they can’t understand what they read,” making it difficult to teach them. This laxity in the qualification paved the way for many orientals as bus drivers. Prior to July 17, 1941 there were only about four Japanese boys out of the 250 bus operators. After July 17,1941 to July 7, 1942 there were only about 33 Japanese boys out of the total 350 and after this there was a gradual increase in the hiring of Japanese boys until the number employed reached to about 65% out of the total, that is about 250 out of 384. Sailors: drunk hang around drivers, swear, vomit on buses; sailors the most courteous, generous, helpful, nearly always aid the underdog. Soldiers: in general, well behaved except when drunk but cut them some slack when back from war zones; “no damn good” – swear, act superior over other races; they think bus drivers are 4F when drivers are as vital to the war; they like “cheap feels” – won’t move to the back because they like to rub themselves against girls. Defense workers: some just as bad as sailors; “mainland defense workers are scum” – crude, boisterous, always griping; some are all right. Civilians: women give more trouble than the men; some boys on bus just to make trouble; don’t trust old Japanese but do trust younger ones since have American ideas. Sailors defend elderly Japanese men, women; when a defense worker picked on the driver, sailors came to his defense. One time a drunk haole hit me from the back and turned the steer accidentally, but I was mad and hit him back with all I had. He fell down and got hurt [so] that I took him to hospital. The cops came but they couldn’t do anything because I was right. I’m responsible for the passengers y’ know. I work two years already. Most of the passengers are good, but some of the haoles think they’re too good. That’s why I get mad face all day. You know the other day a haole guy wanted to stop at _______ St. while coming up Nuuanu way, and I didn’t stop for him because no more bus stop sign there. Before there was a bus stop but ever since the war, it was taken off. He got angry at me and told me that he’s going to turn me in. Yeah, and a haole lady wanted to stop where there was no bus stop and when I didn’t stop she rode all the way up Nuuanu and then back. I told her that she had to pay another bus fare for the return trip but she refused to pay just because I didn’t stop the first time. She told me she was going to turn me in and she called me a Jap, too (10/12/43). The passengers standing crowd around the bus drivers just as if he was a God, while half of the bus is empty in the rear. The women shoppers who go to town in the morning to buy things and wait til the busy hour of the afternoon to go home when all the school children and working people are trying to get home early. The pulling of the buzzer more than 1 or 2 times. People getting on the wrong bus. People asking the driver if he’s going to Kaimuki when his sign reads Waikiki and vice versa. There are some local boys, a big gang, who are always looking for such men. They ride the bus during the night with the intention of looking for trouble. I don’t know why, but these boys seem to have it in for the servicemen. They don’t like them and they told us that anytime we need help just call on them. They’re a rough bunch, but in a way it’s good to have them on the bus when driving toward the airport. They sort of protect us, esp. small guys like me. Drivers blamed the increased rowdyism on the buses to folks having more money to buy more liquor; to “war nerves”; to the lack of assistance from the Army and Navy to help keep order. Defense workers, sailors, soldiers, marine cannot tell the difference between a Japse., Korean, and a Chinese. . . . But one would have to be philosophical about such matters. After all, when people aren’t too well educated anything can happen. Please visit our companion website Local Citing where we feature several community studies form the RASRL Collection in the Mapping the Territory exhibit. May 27, 2016 in Ethnicity and Race, Hawaiians, Jobs and Occupations, World War II.